As many of you know, we have been working on a downstairs renovation and re-decorating project for about a year now. One of the rooms we just completed is our living room. 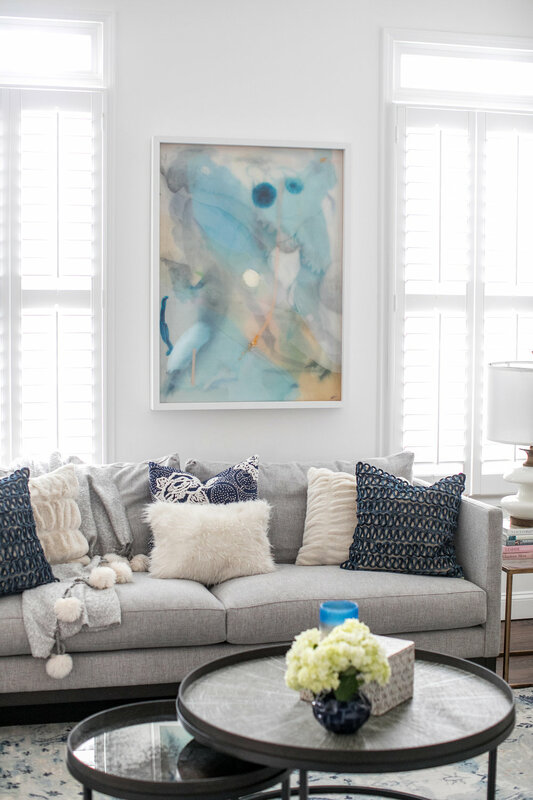 I partnered with Arhaus to furnish this room and am so happy with how it all came together! If you are not familiar with Arhaus, you need to be! Arhaus creates hand-made, globally-inspired furniture and decor pieces. 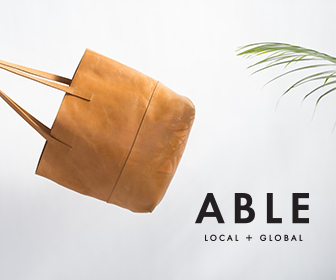 The styling, quality and workmanship of each and every piece is stunning and unique! If you live in the Atlanta area, there are two gorgeous showrooms in the city, one in Buckhead and then the one I frequent in Alpharetta. See all the national locations here. First things first, The Pier sofa. The first piece I selected for the room was the sofa. Arhaus has such an amazing sofa selection, this was not an easy decision! I was drawn to the clean, modern lines of The Pier, which is handmade in North Carolina, using sustainably sourced hardwood and a recycled-steel spring suspension system. I selected a custom fabric called Tanza Glacier, and love the texture and versatile gray/blue hue. Next, I selected two Dori chairs, both custom in Mitch Blue fabric. I love that Arhaus offers hundreds of ways to customize each piece, from the wood to the fabric and nail-heads. Also, Arhaus offers complimentary design services, which I utilized in helping select fabrics. It was a dream and made the selection process stress-free and fun! Quite possibly my favorite new addition to this room is this Stinson Watercolor Rug. A statement rug like this one is such a beautiful way to tie in colors from the room, or bring in color to a neutral room. This Arhaus rug is handmade/hand-knotted, and I have never seen anything quite like it. Arhaus has an amazing rug selection that can be shopped online here. I also added this single Agate Martini Table, the perfect counterpart in between two chairs for resting a drink.. 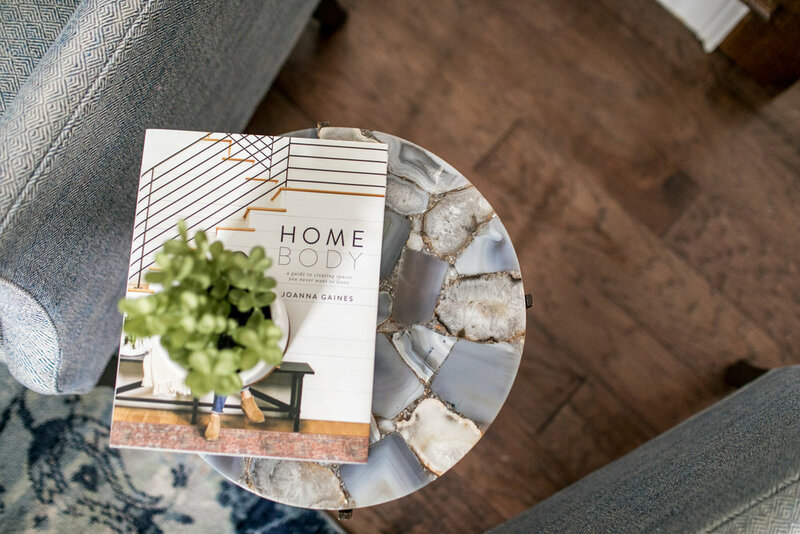 This stunning mini-table is handmade, made of Agates (crystallized Chalcedony found in volcanic rock), and the colors play off the rug and room so well! Another aspect of Arhaus that I was thrilled to discover is the pillow selection. Arhaus has hands-down the most gorgeous and unique pillows I have found anywhere! The prices are so affordable for the amazing quality, and the options are constantly changing, which makes it a fun place to shop for pillows seasonally! 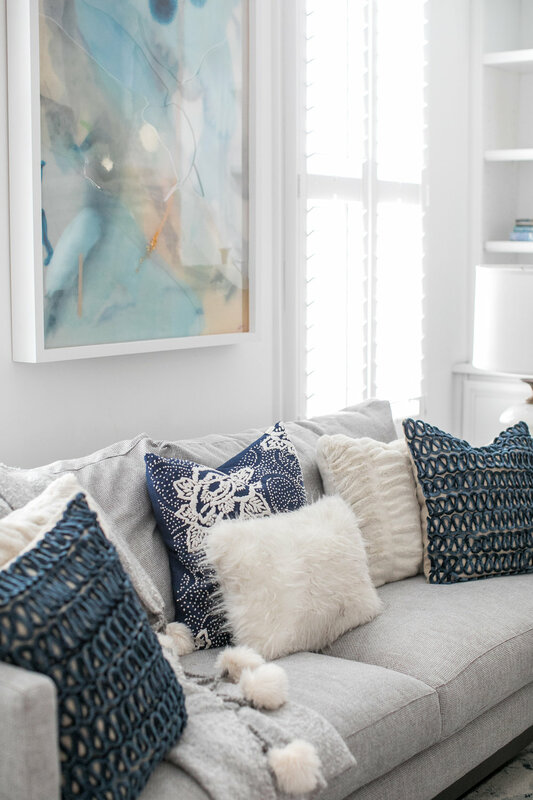 For our living room, I mixed cozy and versatile faux-fur pillows, with stone washed velvet and velvet loops, and then added a bit of floral and long wool to the mix! 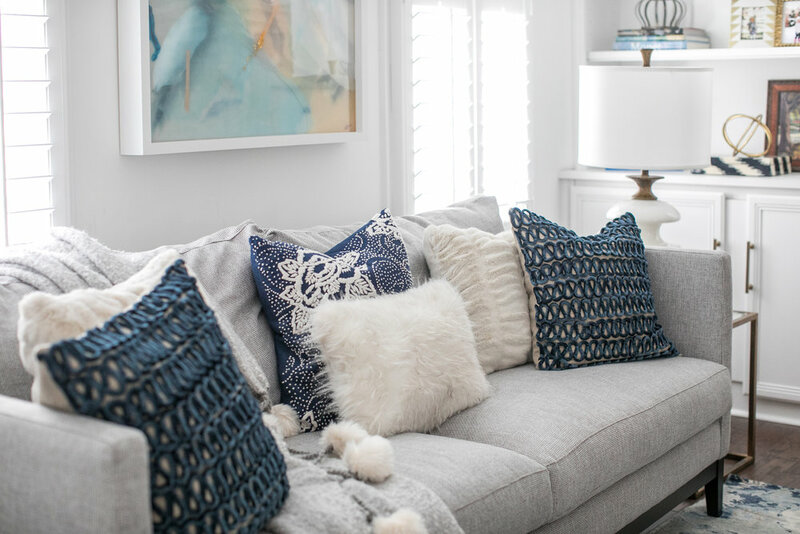 I love that these pillows add lots of texture and character to the room, and that they can all be restyled in other rooms, as well! I will be sharing more details about the commission process with Aaron Harris Art on the blog soon, but in the mean time you can hop over to my Instagram profile “highlights” for a peek inside the process. Aaron can work with any style, color palette and budget and is a true joy to work with! Check out his website here. This room was so fun to create and see come together, and I love the mix of cozy and glam! 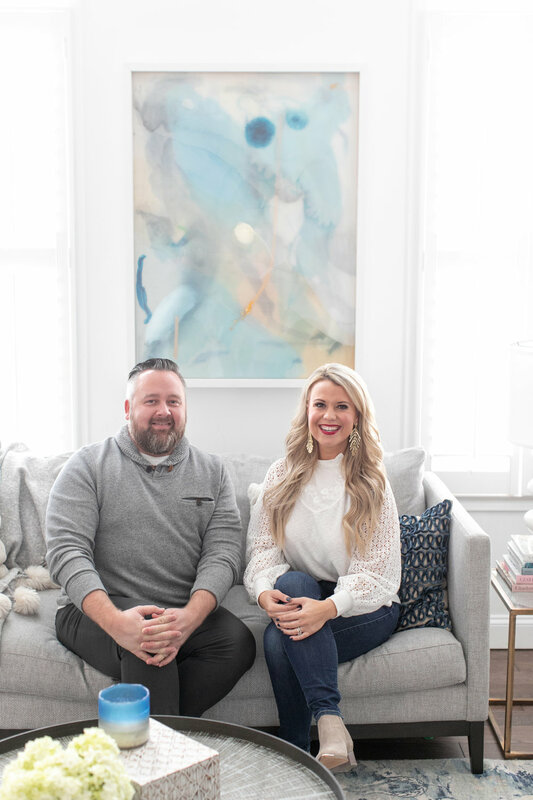 A big thank you to the Arhaus team for being so amazing to work with! I can’t wait to do a lot of hosting and entertaining in this happy space!